From the train window, you see the green mountains of the Yablonovy Range and river valleys dotted with an occasional hamlet of wooden houses. The ride through Transbaikalia is one of the most striking segments of the Trans-Siberian Railroad, yet few travelers stop here. On the long trip between Moscow and the Pacific Ocean, the Trans-Siberian Railroad trundles past Lake Baikal in Eastern Siberia and enters an obscure part of Russia called Transbaikalia. From the train window, you see the green mountains of the Yablonovy Range and river valleys dotted with an occasional hamlet of wooden houses. The ride through Transbaikalia is one of the most striking segments of the Trans-Siberian Railroad, yet few travelers stop here. The region’s capital city, Chita, is a great place to start exploring. Chita is located just 500 kilometers north of China at the confluence of the Chita and Ingoda Rivers. Chita fell under Russian influence when Cossack explorer Pyotr Beketov established a camp here in 1653. When Beketov arrived, Transbaikalia was still part of China. In 1689, Russia and China signed the Treaty of Nerchinsk, which annexed Transbaikalia to Russia. One year later, a Russian fort was built where Chita now stands that expanded into a town when silver was discovered nearby. By 1860, China had ceded its northernmost territory to Russia, from Transbaikalia to the Pacific Ocean, and Chita became one of the last outposts before the new Russian Far East. Chita is also a jumping off point for remote forests and steppe that have traditionally been home to the Buryat people. The Alkhanay National Park, just east of Aginskoe, is one of the best places near Chita to get close to nature. The park features forested mountains, mineral springs, and several rock formations considered holy sites by Buddhists. 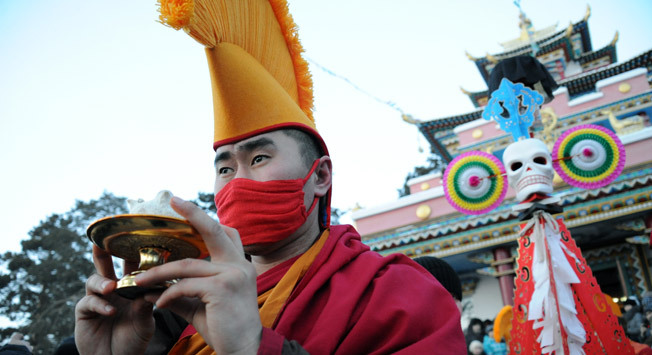 The 14th Dalai Lama visited Alkhanay in 1991, and it’s not uncommon to see Buddhist pilgrims trekking in the park. Australia-based Russia Tour can help provide more information on arranging a trip to Alkhanay. Email info@russiatour.com.au.